Nauheim passive house skylight domes have been developed and optimized with the Passive House Institute in Darmstadt. This allows for heat transfer resistances of Ueff values with dark skylights of 0.563 W/m²K and with Skylights of Ueff = 1.04 W/m²K. These values have been determined for the entire construction. Critical surface temperatures on the inside can thereby be avoided with special construction techniques. 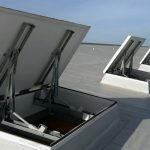 They have been shown to be suitable with the appropriate calculations for both skylight types, and offer architects and building engineers a planning basis for object calculations. 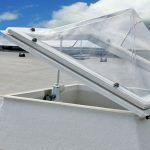 The translucent version of the Nauheim passive house skylight was specially developed for energy savings. They use daylight to derive energy, and can also bring significant lighting cost savings, for example in stairwells. The use of accessories such as roof access, ventilation and natural smoke exhaust are also possible. It has been shown to be suitable for many applications.